Having reached 60 regular-season wins on Monday, there’s not much left to accomplish for the the Tampa Bay Lightning (60-16-4) this regular season. The Bolts became just the third team in NHL history to reach the milestone. However, Jon Cooper’s team suffered a 4-2 road loss to the Montreal Canadiens on Tuesday night. Tampa Bay has just two games remaining this regular season. Thursday they’ll be in Toronto taking on the Maple Leafs. The Lightning’s regular season will conclude this Saturday against the Boston Bruins. On this occasion, the Lightning had no answer for the Canadiens’ attack in the third period. The victory moves the Canadiens (42-29-8) into a tie for the second wild card in the Eastern Conference. Claude Julien’s men have won six of their last eight games, and they’re just one point behind the Carolina Hurricanes. "When we're on our game, we're a hard team to play against"
Julien was undoubtedly pleased with his team’s performance after the game. His team out-shot the visitors 45 to 24. They also won almost 62 percent of their faceoffs and didn’t grant Tampa a Power-Play opportunity. The Canadiens took their first lead of the game through Artturi Lehkonen‘s goal in the third period. The left winger slapped the puck out of mid-air, past reserve goalie Edward Pasquale. The 28-year-old did make 41 saves for his team in just his second career NHL game. The constant pressure that the Canadiens put on the Lightning made it a very tough road environment. Granted, the Bolts already earned the President’s Trophy and were playing their third game in four nights. Still, a fast-paced bandwagon is beginning to brew as the Canadiens’ look to continue their late-season surge. The Canadiens’ final two games of the season will also come on Thursday and Saturday. First they’ll visit the Washington Capitals before hosting the Toronto Maple Leafs for their regular-season finale. Considering Tuesday’s performance and their recent form, the Canadiens’ 82nd game of the season may not be their last. 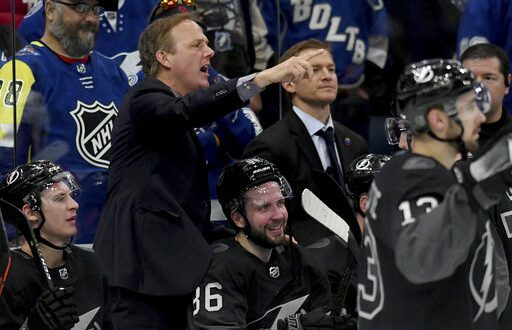 For the Bolts, the last two games represent an interesting conundrum for Cooper and his staff. The likes of defensemen Victor Hedman (upper body) and Dan Girardi (lower body), along with goalie Andrei Vasilevskiy (rest), were all missing on Tuesday. While resting important players will surely be on Cooper’s mind, heading into the Stanley Cup Playoffs with momentum may be just as pivotal. The Bolts match against the Maple Leafs will begin at 7 p.m. ET on Thursday.